After AMG C43 and AMG SLC 43, Mercedes is all set to unveil the Mercedes Benz E43 AMG 4Matic 2017 at the 2016 New York Auto Show. 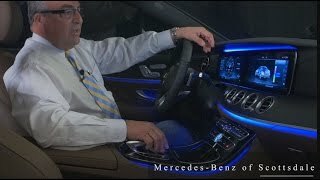 The model brings with is sportive looks that commendably narrate the power it carries beneath its hood, while the technology and luxury is as one can expect from the house of Mercedes Benz. 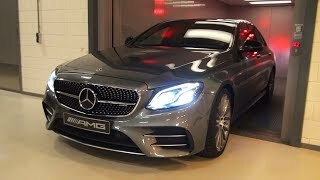 Let us have a look at the review of Mercedes Benz E43 AMG 4Matic 2017 to know in detail about it. The interior of Mercedes Benz E43 AMG 4Matic 2017 is a lap ahead in terms of sportiveness when compared to the standard E-Class model. Entering inside you’ll notice the sportier seats replacing the standard units while the MB-TEX/Dinamica wrapped upholstery adds further with its red stitching contrast. The same essence can be further noticed over the dashboard and door panels. Sitting over the seats, driver will have the flat bottom three spoke sports steering wheel wrapped in Black Nappa with red stitching adding the contrast. The instrument cluster features blue light and again with the red needles getting featured through two-analogue dials and seven-inch screen. Thus rounding up the interior details of Mercedes Benz E43 AMG 4Matic 2017 I’ll call it a sportive amalgamation but not over sportive. The exterior of Mercedes Benz E43 AMG 4Matic 2017 is designed to bring something that can be housed between the Sportive AMG E63 and the standard E-Class model. Starting with the front fascia, we now have a diamond grille sitting amidst the LED headlights. Beneath the setup, we have the bumper that gets three large openings while the outer intakes get horizontal fins. Moving towards the rear, you’ll notice the 19-inch five-spoke wheels drenched in high-gloss black. At the rear end the chrome plated quad-flow exhaust tailpipes adorn the model with remaining essence while the spoiler lip mounted over trunk lid complements the entire set up further. 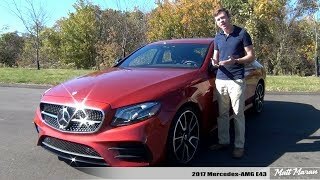 Thus rounding up the entire exterior details of Mercedes Benz E43 AMG 4Matic 2017 I would say, it is sportive but not that beefy. Powering the Mercedes Benz E43 AMG 4Matic 2017 is a 3.0 liter V6 engine cranking total output of 396 hp and peak torque of 520 nm paired to nine-speed automatic transmission. 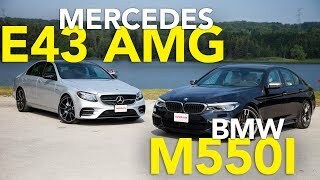 With this the top speed of Mercedes Benz E43 AMG 4Matic 2017 touches the mark of 155 mph (electronically limited) while the 0-60 mph sprint can be knocked in just 4.5 seconds.